Is this really the best England can do? It never fails to amaze me reading the contrasting opinions from our feedbackers at Cricinfo while covering these one-dayers, especially with England in such limp form. Of the 1000 or so emails, a fair chunk criticised us for our anti-England stance, accusing us of racism, bias toward Ireland and whatever else. What game were they watching? The one we were watching was between a feisty, energetic team full of lively promise and intent. The other was England at their timid best. The odds of Ireland reaching the Super Eights before the World Cup got underway must have been fairly long. Yet here they are – the tournament’s most slippery of banana skins – about to face the mighty England. Read Miller’s preview. Check the scorecard. Leave a comment and chat away! 48.2 Malinga to Peterson, FOUR, Peterson does it for SA with a edge past the slip. Fullish, outside off stump, Peterson drives, gets a outside edge and it runs down to third man boundary. SA have won. They choked at the end but have pulled it off. Peterson jumps in the air, pumps his fist and then smashes the stumps down at the other end. Immediately apologises! Worth reading the commentary for the last five wickets. What a match. Are we going to miss Australia’s dominance? This has been nagging at the back of my mind for a while, so am just penning it down before it disppears completely. Someone was recently talking about the West Indies, and how the World Cup could provide the spark needed to relight passion in the country. Fledgling interest, and so forth. Everyone, so he said, loves the West Indies and wants them to succeed – wants them to be back on top of the world, like they were in the 1970s and 80s. Back then, I imagine there was a similar feeling of foreboding toward West Indies as there is nowadays for teams facing Australia. They steamrollered the opposition, trampling all over them like bastards. Like Australia have been doing for the past 12 or so years. But, if and when this Australia side collapse into an arthritic heap, will we mourn them? 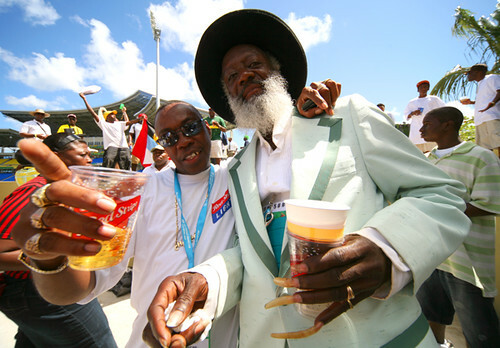 Will we, in 10 years, have the same feeling that we now have for the West Indies: wanting Australia back to their best? Not bloody likely. I will dance from the rooftops when some of their ageing limbs start to crumble. I’ve had enough of their strutting, their casual arrogance, their one-handed mis-hitting-for-six-over-long-on (Hayden; Gilchrist; whoever). It’s not big, it’s certainly not clever and it’s boring and ugly cricket. Oh, and while I’m ranting – Nathan Bracken wears a hair band. Nathan Beckham he should be known as. Or, perhaps, Alice Bracken. The first of the Super Eights, between Australia and the West Indies. Down with the Aussies; casino online up with the Windies! Scorecard. Get chatting.